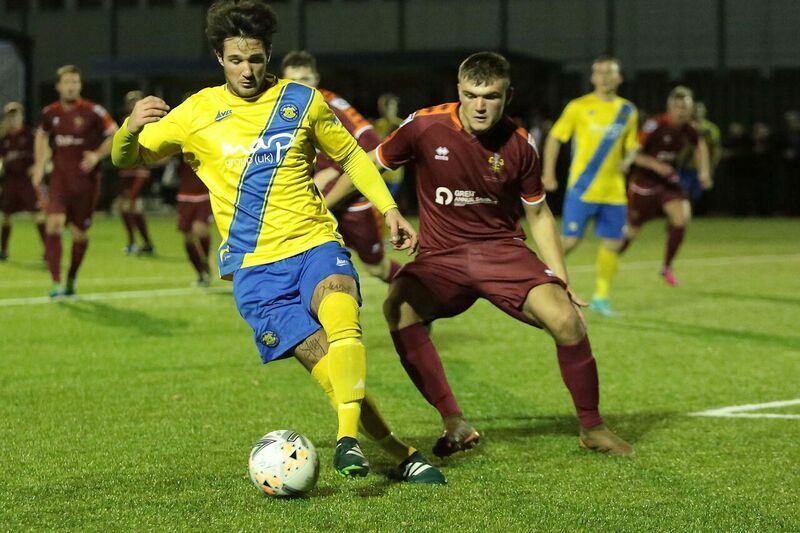 Stockton Town claimed one of their biggest ever scalps in progressing to the second round of the Durham Challenge Cup with a 2-0 triumph over Spennymoor Town on Wednesday night. The exciting cup tie saw two closely matched sides both pushing for victory. Two goals in two late second half minutes came from a Callum Williams own goal and from substitute Peter Bulmer to seal Stockton’s passage into the next round. Moors inevitably made several changes to their usual starting line-up but they still fielded several players with a plethora of National League North experience. 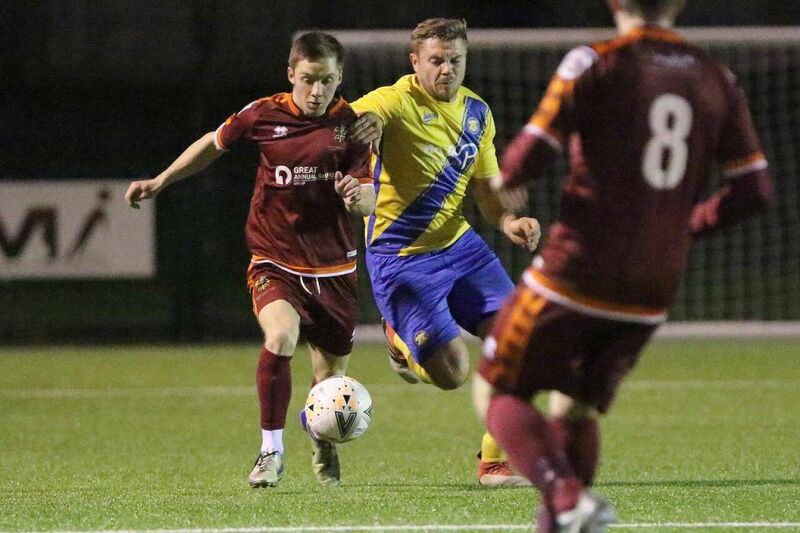 Alongside a selection of promising youngsters, the visitors named former Gateshead stalwart James Curtis, former Newcastle youngster Williams, Shane Henry and top marksman Adam Boyes. There was also a Coverall Stadium return for Anchors favourite Kevin Hayes. The returning winger Hayes gave Anchors fans an early reminder of his threat inside the opening minute, not that it was required. He showed a blistering turn of pace to latch onto youngster David Webb’s through ball before lashing a low effort just wide. Stockton fielded two players that boast Moors among their previous clubs in a strong starting line up and they both linked up to produce their side’s first meaningful effort on goal after a quarter of an hour. James Risbrough’s marauding runs from left back would prove to be a thorn in the side of young Spennymoor full-back Jack Howe for the duration of the evening and this was a precursor of what was to come. Jake Petitjean spread the play delectably and Risbrough showed brilliant touch to bring the ball under control. He ghosted past Howe before crossing to fellow ex-Moors player Mikey Roberts. The forward struck goalwards but his effort deflected up into the arms of Chris Elliott. The Anchors began to grow into the game and built a sustained period of pressure as the first half progressed. They could have taken the lead just before the half hour. Risbrough again left Howe in his wake, the full-back having no answer to the pace of the Stockton left back. He got to the byline and pulled back across goal but couldn’t find the onrushing Matthew Garbutt with his cross and Moors cleared the danger. Stockton were pressing and could have had the opener soon after. Spennymoor failed to clear Max Craggs’ corner and the ball dropped at the feet of Adam Nicholson. He brought the ball under control with his back to goal, turned sharply and got struck a left-footed effort that slid agonisingly wide of Elliott’s right-hand post. Moments later, Risbrough could have broken the deadlock himself as he continued to be a threat down the left. This time he took matters into his own hands and fizzed a vicious half-volley across the face of goal. Elliott was beaten but the effort crept wide of the upright. The game saw a disjointed start to the second period with both sides pushing but failing to wrestle the initiative. Spennymoor carved out an opportunity with Hayes sliding through to Thompson. Just as the midfielder went to pull the trigger, he saw the chance snuffed out by the impressive Tom Coulthard. There was further defensive prowess on display as the game headed towards the hour mark. Risbrough and Nathan Mulligan linked up with the full back being played in behind the Spennymoor defence. Risbrough took one too many touches and saw his chance nullified by a brilliant challenge from imposing Moors captain Curtis. The Anchors could have taken the lead in unusual circumstances on 67 minutes. Roberts struck a pot-shot from range that almost caught Elliott napping at his near post. The Moors ‘keeper scrambled across his goal at full stretch and just about managed to maintain his clean sheet. The deadlock was finally broken in the game’s 78th minute and Risbrough was directly involved again. He once more eluded the Moors defence down the left and drilled a low cross across the face of goal. The cross was too hot to handle for his opposite number Williams who diverted the cross high into the roof of his own net. One became two less than a minute later as Stockton’s pressure paid off. Excellent play by Bulmer saw him jink his way into the Spennymoor box before curling a stunning finish beyond Elliott and into the far corner to secure the tie for his side. Spennymoore kept pushing and struck the bar through a Hayes free kick with the final action of the game but it was Stockton that progressed into the next round. It was an excellent performance that will surely send Michael Dunwell’s side into Saturday’s home league fixture against Ryhope brimming with confidence. Full time at the Coverall Stadium – Stockton Town 2-0 Spennymoor Town. Stockton Town: Arthur; Garbutt, D Mulligan (Bulmer 45’), Coulthard, Nicholson (c), Risbrough; N Mulligan, Craggs, Petitjean (Ward 60’); Stockton (Coleman 73’), Roberts. Subs not used: Carter, Mohammed. Goals: Williams OG 78’, Bulmer 79’. Spennymoor Town: Elliott; Howe, Atkinson, Curtis (c), Williams; Thompson (Sloan 70’), Henry (Procter 45’), Russell, Hayes; Webb (Brown 73’); Boyes. Subs not used: Lawrence, Krokhin.